It’s coming. The real winter weather. So today we took advantage of our last spring-like day before the big freeze. Long after Mary and I had come in from lunch, Emma was busy at work with one of her birthday gifts. I love this next picture. I wasn’t sure if she was really catching birds with her binoculars. 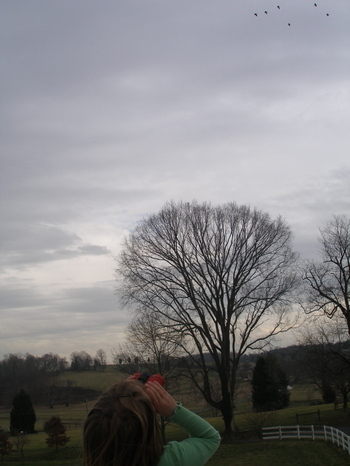 But when I saw her get these Canada Geese in her sights(the little dots in the top right corner), I knew she was…. 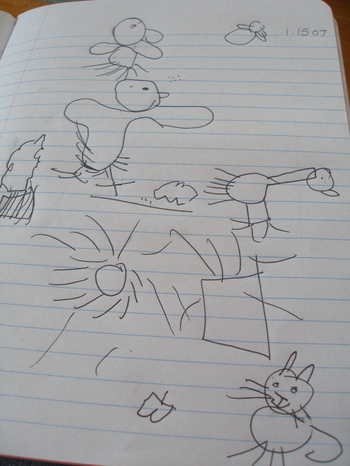 Then she carefully recorded everything she saw in her notebook, including Canda Geese, a Turkey Vulture, leaves, electric fence, pine trees, and a cat. Emma and Dan just started reading "Little House in the Big Woods" before bed each night. Of course Emma seems especially fascinated by all the hunting and detailed deer and pig-butchering scenes. She’s glued to the stories in those parts. Today, I overheard her calling Mary, "baby Carrie". So I have a little Ma Ingalls project planned for the two of us tomorrow. My grandmother, is my "Ma Ingalls" go-to–I’m borrowing some of her "tools" for tomorrow’s project. I’ll be sure to show some pictures. "Are you listening to me? Look at yourself. We don’t look like each other. You’re made of wood. I’m made of rubber. So you can’t possibly live in this doll house." 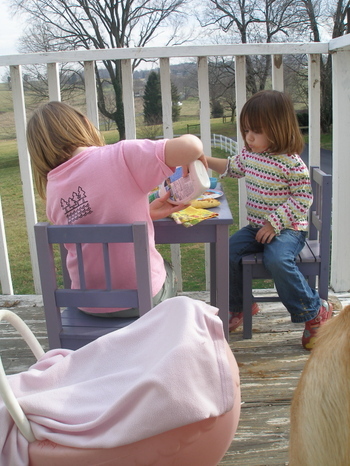 I’m going to refrain from adding any type of interpretation to this pretend play. We read all the little house books out loud to our boys when they were younger. Love them. Emma is doing a nature journal!! We did that for many years, and the kids learned so much!If we every get around to a phone call I can fill you in with all the details. It’s a super way to do science with them. All of this is totally cracking me up. I love listening in on my daughter too, she says the craziest stuff sometimes. love it! Emma should read the “Doll People” when she is a bit older. It’s about doll’s living in a house that were made in different centuries…my daughter loved it! I love the little people conversation, they are so insightful in many ways. Little House in the Big Woods was every bit as enjoyable for me as for Emma, I couldn’t stop thinking about Carol Ingalls and would find me thinking of her even when I was going to bed at night. I am fascinated by that series. I wonder if J would be interested in the Little House books… I’d love to reread them! I see a future artist in that little one! That is so sweet! I read a book called Four Dolls when I was younger that I think your girls will love! I may have to dig it out for myself. the little house books were my favorite as a child. i am anxiously awaiting the day when jane can read them…next year, i think. i love eavesdropping on my girls. they say the best things when they think no one else is listening! 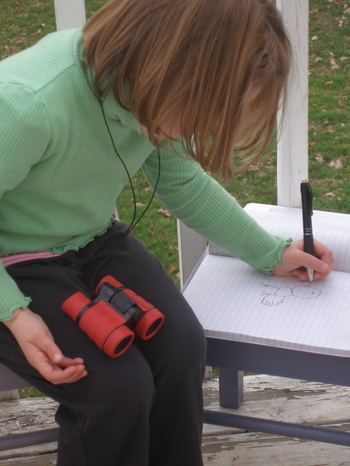 Very serious business bird watching and writing down observations! Too cute. I was so excited for my daughter to read the little house books, the first one I picked up for her, she loved it until the end. I think Jack the dog died and my daughter (who is very sensitive to these things) came running out of her room in tears saying she was never going to read those books again. Oh dear. I love the drawing and what a funny conversation! So cute, her reasoning. Every single thing about this post made me happy!!! I love the bird drawings – as I child I spent many, many hours drawing birds and I still remember how much I loved it!And the comment about the dolls house is cracking me up! Her notebook is amazing! That is absolutely marvellous. My children had notebooks for safari, and I wish I could get them more interested in our own backyard. Laura Ingalls has been a favourite since I was a little girl. So fascinating to think about how life was and is, and how things were done and made. I love kids and ‘binocliers’ (as Jack would say it). We were lucky enough to see a commet tonight that is in our skys for the next few days as it circles the sun! i so remember getting binoculars from my grandma when i was young and i looooved them. keep warm molly, hot chocolate stat! As I read your post the photos of your daughters drawings really looked familiar to me, than I remembered last year while teaching my oldest daughter how to draw pictures more exact I went to the library after researching this book series. I still use it occasionally for homeschooling purposes but my 5 yr old just isn’t into drawing as much as my 7 yr old is. Check out “Draw, Write, Now” series for learning how to draw and than it teaches children how to write descriptive sentences to go along with it. I did end up purchasing two books here for at home since they weren’t at the library with the remaining series. Gorgeous drawing! I love children’s imagination. I just discovered your blog! You must be so proud of the little dots on the side of the picture. I am amazed at the detail. I look forward to reading more.